Every year, to support eye health around the world, all of us at Rx Optical participate in World Sight Day. More than 600 million people around the world are blind or vision impaired because they don’t have access to the eye examination and glasses they need. The organization Optometry Giving Sight funds projects that gave sight and hope to more than 1 million children in 2017 alone. They are passionate about the work they do, and we are excited to support that work. The money raised on World Sight Day supports programs that train local eye care professionals, establish vision centers, and deliver eye care and low-cost glasses. Leading up to World Sight Day, Rx Optical gathers donations by putting together fun baskets to auction off. We create baskets with themes such as golf, family game night, toolkits, and more. Our employees buy raffle tickets to win those baskets, and the money from the raffle goes toward the World Sight mission. We also purchase World Sight t-shirts and wear them in the office. We are passionate about promoting good vision health around the world and are especially excited that this year’s campaign will support children’s vision and will help give kids who have struggled to see properly their first pair of glasses. It’s sad to think that there are millions of children around the world struggling to learn and frustrated with their lives simply because they can’t see and can’t afford proper eye care. 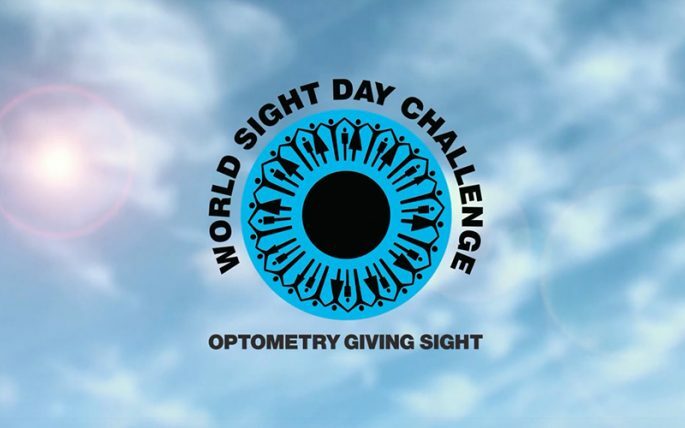 The World Sight Day Challenge makes it simple and fun to help these kids. And, even our patients can get involved. You can make a donation to support the World Sight Day mission here. By becoming a donor, you will be helping to transform lives through the gift of vision. You can learn more about the Optometry Giving Sight organization on their website, and you can see how we are celebrating sight by stopping in to any of our locations!